Yet another HYIP scheme pushed on the TalkGold and MoneyMakerGroup forums has been outlined by federal prosecutors — this time in Florida. The name of the scheme was Alpha Trade Group (ATG), and web records show that the scheme was pitched on TalkGold and MoneyMakerGroup beginning on Oct. 7, 2009. Court records, meanwhile, show that ATG already was under investigation by the U.S. Department of Homeland Security when the first posts to promote the scheme appeared on the forums. Just days earlier, on Sept. 25, 2009, a U.S. bank closed an account prosecutors later linked to the scheme, according to court records. Taken together, the court and web records strongly suggest that the ATG investment “opportunity” first was advertised on MoneyMakerGroup and TalkGold when the scheme already was in a state of collapse because one of its key money conduits had been blocked. 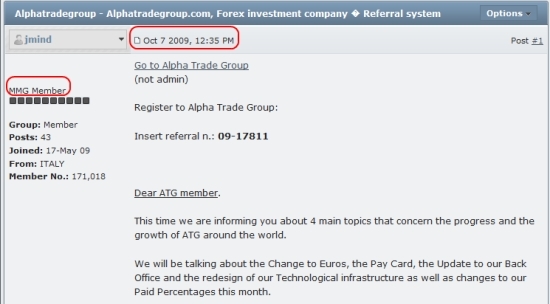 This screen shot shows the first post about Alpha Trade Group appeared at the MoneyMakerGroup Ponzi forum on Oct. 7, 2009 -- days after a U.S. bank already had closed an account linked to the scheme amid fears it was being used to launder money. This screen shot, taken from Paragraph 23 of a federal affidavit in the ATG Ponzi case, shows that a U.S. bank closed an account later linked to the scheme at least 12 days prior to the ATG promo on the MoneyMakerGroup forum. Court records show the scheme already was under investigation by federal authorities before the sales posts were made on the MoneyMakerGroup and TalkGold forums. It is possible that the scheme was in a state of collapse even earlier than September 2009. Court records show that at least one bank account tied to the business was closed on June 18, 2009 — nearly four months prior to the first posts promoting the scheme on MoneyMakerGroup and TalkGold. One MoneyMakerGroup poster — apparently angry that the program was being advertised in public — scolded the poster who started the thread. The post scolding the advertiser appeared on Oct. 29, more than three weeks after the original sales pitch appeared on the forum and more than a month after federal agents began their probe into ATG. By Feb. 22, 2010, federal prosecutors and Immigration and Customs Enforcement (ICE), a division of the U.S. Department of Homeland Security, were in federal court in Orlando filing a forfeiture complaint. The Feds sought the seizure of $316,418.50 in a bank account linked to the scheme, according to court records. The forfeiture complaint alleged a Forex Ponzi scheme, and prosecutors linked the fraud to ATG, a Florida company known as Online Market Solutions and at least four individuals: Jose Cecilio Martinez Beltran, Francisco Amaury Suero Matos, Yehodiz Padua Valentin and Welinton Bautista Castillo. Unnamed “others” also were referenced in the complaint. A federal judge ordered the money forfeited on July 26, according to court records. The case was brought by the office of U.S. Attorney A. Brian Albritton of the Middle District of Florida. Albritton’s office is handing a number of highly complex financial-fraud schemes. Websites such as TalkGold, MoneyMakerGroup, ASAMonitor and MyCashForums have promoted one fraud scheme after another. TalkGold, MoneyMakerGroup and ASAMonitor are specifically referenced in court documents filed in the Pathway To Prosperity (P2P) fraud scheme. P2P’s Nicholas Smirnow was charged in May by the U.S. Postal Inspection Service and federal prosecutors in Southern District of Illinois with operating a massive HYIP Ponzi scheme that affected investors across the world. MoneyMakerGroup also is referenced in court filings by the SEC in the alleged Legisi Ponzi scheme. Earlier this month, the U.S. Department of Justice announced that the U.S. Secret Service had helped bring about the arrest in France of an alleged international thief in part by monitoring criminal forums. Vladislav Anatolievich Horohorin, 27, was arrested by French authorities in Nice. Court filings show that the Secret Service used undercover agents and “undercover communications” to develop the case. Federal records show that ATG purported to be registered in Panama and was using “various corporations and fictitious names registered in Florida” to pull off the scheme. Among the names used was “Orsa Investment Group LLC,” according to an affidavit filed in the case. The scheme began in April 2009, according to court filings. An ICE agent said in an affidavit that the Internet and “business opportunity meetings” in Central Florida were used to promote the scheme. Read the ATG forfeiture complaint, which paints a picture of a commission-based, multilevel-marketing (MLM)Â scheme within a Forex fraud scheme — and other schemes within schemes. This indicates that there could be other bank accounts involved in Columbia and/or other South American countries. Thanks for sharing that link. I do hope readers will take the time to pore over the blather on that site. It is positively chilling, providing yet another reference to Medellin in the context of online HYIP and autosurf frauds.